HTC today kicked off a week-long sale that sees some of the best-ever prices for its handsets. Notably, the new HTC U Ultra has been knocked from $749 down to $599, a significant cut for the smartphone. The U Ultra is an all-glass Android phone from HTC that boasts top specs. HTC also slashed the price of the A9 from $499 to $199, the HTC 10 from $699 to $499, and the Bolt from $600 to $450. The sale prices are good through April 23. HTC sells its phones unlocked via its U.S. web site. HTC has indicated via its web site that the U Ultra, the company's flagship handset for 2017, will begin shipping on March 10. The $750 smartphone comes in black, white, or blue, and features a 5.7-inch screen, Snapdragon 821 processor, 16-megapixel camera, and personalized sound profiles. Software features include Android 7 Nougat with HTC Sense and HTC's new Sense Companion personal assistant. The phone is sold unlocked with support for AT&T and T-Mobile. HTC plans to exit the entry-level phone market moving forward and will instead focus its handset portfolio on high-margin devices. The company made the comments during a conference call with media to discuss its fourth quarter financial results. HTC said it will continue to sell and support entry-level phones that are already in the channel, but the company will reduce the total number of new phones to six or seven for the 2017 calendar year. HTC cited the high level of competition in the entry-level space as one reason for dropping low-cost phones from its lineup, as well as the slim chance it will be able to create profits from such phones. The company said it needs to focus on profitability in its handset business moving forward and will thus make only mid-range and high-end devices. HTC announced the U Ultra (pictured) and HTC U Play at the Consumer Electronics Show in January. These phones are expected to go on sale in March. The HTC U Ultra and U Play are the company's new high-end phones, replacing the iconic HTC 10 and One series. They sport flowing 3D curved glass on the back, and high-end specs. The U Ultra also has a secondary touch screen above the main display. The U series also includes a learning AI assistant, as well as traditional HTC features like UltraPixel cameras, BoomSound Hi-Fi, hi-res audio, and HTC Connect for wireless media streaming. What are the U phone like in person? We checked them out. 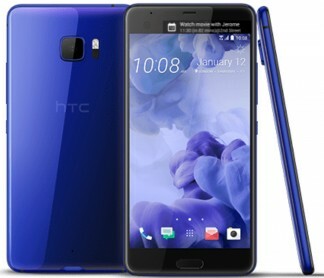 HTC today announced its new flagship phone, the HTC U Ultra, along with a smaller version, the U Play. Both phones have a new design with colorful glass on the front and back, and a metal frame. The rear glass is fully curved at all four edges, a first. 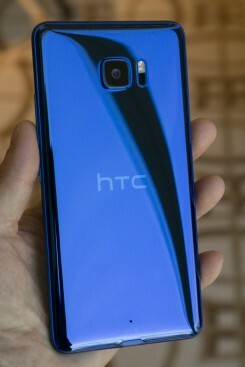 HTC developed a unique process called optical spectrum hybrid deposition" to give the glass multi-layered color. Available colors are: blue, white, black, and pink. The U Ultra has a 2-inch secondary touch-screen above the main display, much like the LG V20. New "HTC Sense Companion" software uses an AI to learn about you and offer intelligent suggestions. It can learn which are your most important contacts and apps, and only surface those notifications on the second screen. It can also advise you when to charge the phone if your schedule indicates you may run out of power before bedtime. (The battery rates 3,000 mAh.) The HTC Sense Companion will be on both U-series phones, as well as other new HTC phones this year. The U Ultra's Super LCD 5 main display measures 5.7 inches and has Quad-HD resolution. It's powered by a Qualcomm Snapdragon 821 processor and 4 GB of RAM. HTC gave the U Ultra four microphones that are always listening, and it can record "3D audio". The main camera is a 12-mgeapixel UltraPixel sensor, similar to the HTC 10 but with improved PDAF (focusing). A 16-megapuxel camera graces the front. Other features include 64 GB of internal storage, memory card slot, Android 7.0, Hi-Res audio, Cat. 11 LTE, fingerprint sensor in the home button, NFC, and Quick Charge 3.0. It has a USB-C port with USB 3.1, but no 3.5mm audio jack. 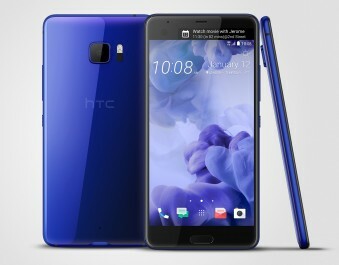 The U Ultra is now available for pre-order from htc.com for $750, in an unlocked version that will work with the LTE networks of AT&T and T-Mobile. It will ship in early March. The U Play has the same design but smaller, with a 5.2-inch display, no second display, and a more modest main camera and processor. Other features are similar. HTC has not announced plans for a US-compatible version of the U Play.